After several delays due to weather and technical problems, a Delta 2 rocket finally lifts off from Cape Canaveral Air Force Station at 8:20 a.m. on 25 September 2009. The rocket is carrying the Space Tracking and Surveillance System (STSS) demonstration satellites on a mission costing $1.5 billion. The two satellites going up on the Delta will, according to the Missile Defense Agency press release, “. . . demonstrate the key functions of a space-based sensor, passing missile tracking data to missile defense interceptors with the accuracy and timeliness necessary to enable them to successfully intercept missile targets.” The press release goes on to state that “On-orbit satellites will test and demonstrate . . .
---Birth-to-death tracking of strategic and tactical missiles. ---Ability to hand-off timely midcourse track data to the Ballistic Missile Defense System (BMDS) kill chain. The goal is to eventually have an entire constellation of missile defense satellites in orbit around the Earth. 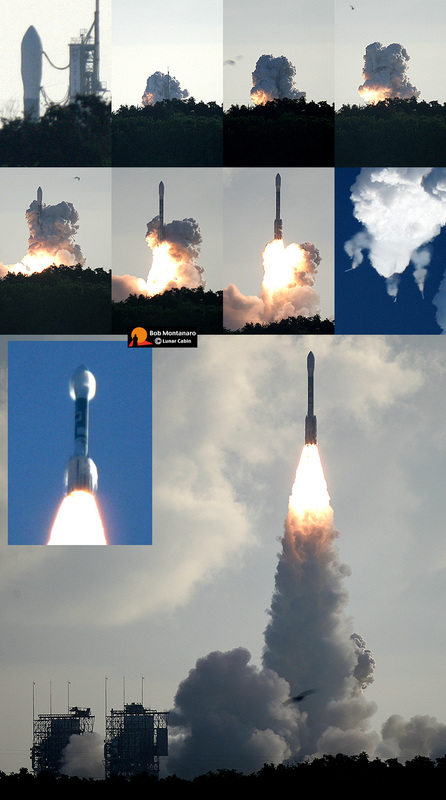 The top two rows of images show the first few moments of liftoff while the very last in the series show the ground-lit solid rocket boosters falling away with the rocket hidden behind its exhaust plume. The inset at middle left shows the halo of water vapor temporarily formed around various parts of the rocket as it accelerates through the sound barrier.